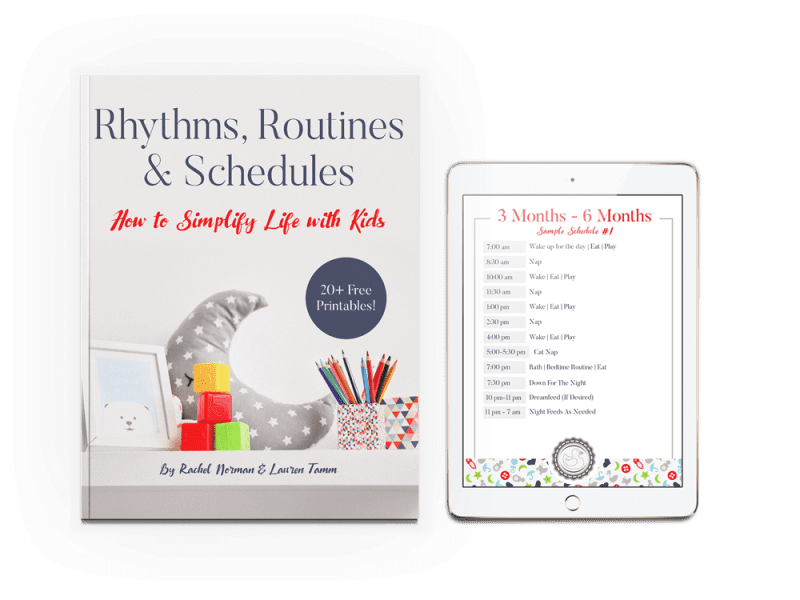 Here is a tried and true (and adapatable) 7 month old feeding schedule that’ll help your little one nap well during the day, sleep well at night, and have peaceful days. I have long said that the 6 to 12 month time is one of my absolute favorites. It can also be a time of adjustment. Baby is finally eating solids and it’s likely time to drop that third nap and probably drop the dream feed if you haven’t already. Baby is getting a little chunkier and wants more food. Actually, this is a precious time with baby. Before I give you what has worked for me as a 7 month old feeding schedule, know this. Babies at this age need to eat as many solids as they can. They will be hungry and breast milk alone will no longer be enough. Or, if it is, you’ll be cluster feeding like your 7 month old was a newborn. ➡️ Pediatricians used to recommend introducing purees or solids at 4 months of age. They now suggest 6 months. 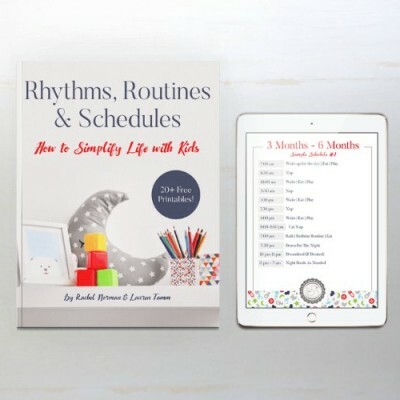 ➡️ So the 5 to 7 month mark generally means that unless baby is getting a lot of breast milk and whatever solids you offer, they will be hungry. And this will affect their sleeping and their moods. And… if baby isn’t sleeping through the night yet. If your baby wakes up earlier or later than this routine, you can simply adjust based on your baby’s wake time. The wake time is actually very important in a baby’s day to day routine. If baby wakes early from a nap, yet is content, don’t push up the feeding. Leave it until normal time unless baby is clearly hungry. 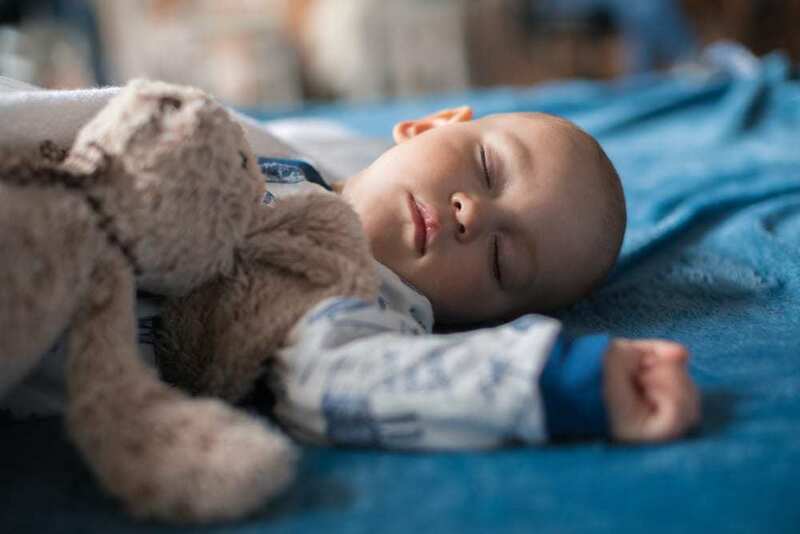 If your baby is still not sleeping through the night, then this is a great time to start helping them do so. Solids and milk throughout the day will help them to fill their tummies and get in the necessary nutrients that’ll allow them to sleep peacefully throughout the night. 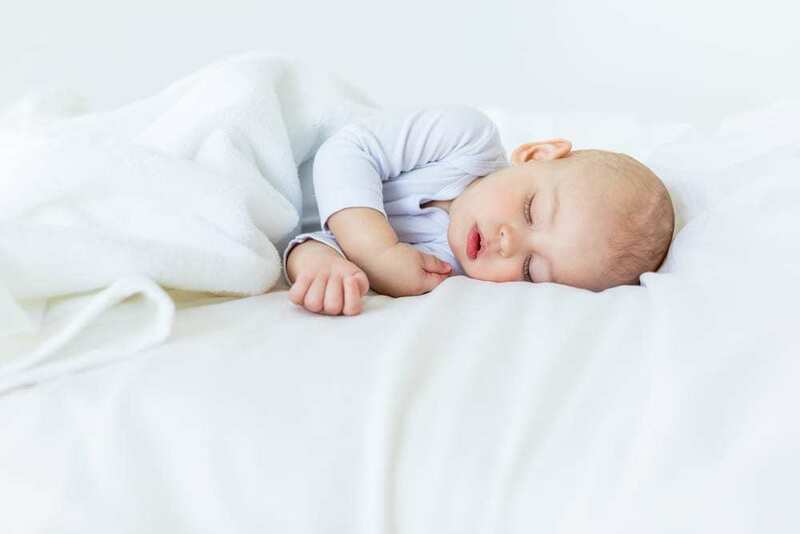 It is actually one of the best times to begin sleep training since baby is naturally a lot less likely to wake if hunger was their primary reason for waking. Imagine baby needs 10 cups (to make things even) of milk and/or food a day. We know all babies are different, but go with me here. If you are currently giving your baby 5 cups of milk and 2 cups of food during the day, that leaves a 3 cup deficit. This means baby will likely wake up at night to get in the full 10 cups he needs. The best way to wean? To give them all they need during the day so they don’t need to wake for it at night. If your baby is still feeding a few times per night then you may want to start doing something called a Dream Feed. Dream Feed: A feed given between 10 and 11 ish at night that should help baby sleep a longer stretch, eventually until the morning wake time. Try feeding baby as much as possible during this feed and weaning baby from other nighttime feeds until eventually the dream feed is the only feed left. After baby has slept until the morning with only the dream feed for a few weeks, then it’s safe to drop the dream feed. At that point, baby should be sleeping all through the night. Here are some interesting things to note or keep in mind during this 7 month period. Babies will likely be able to sleep through the night at this age if they’re eating well enough. Not only are they getting breast milk they are getting solids. 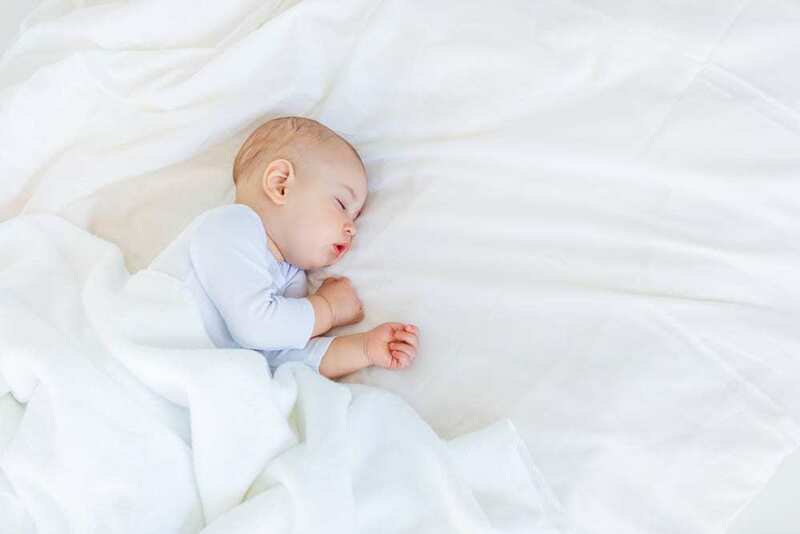 Here’s where you’ll discover if your baby didn’t sleep through the night out of hunger, or if they have some sleep props you need to work on. Baby might act uninterested in solids, that’s fine. Still, continue offering them and be sure to give them veggies or fruits they like so they will get the nutrients needed. Introduce solids slowly so you can monitor the baby’s reaction to them. Don’t introduce too many new foods at once. Give a top up bedtime snack. Right before bed, give baby milk and some yogurt or applesauce, etc. to help fill baby’s tummy before they go down for the night. 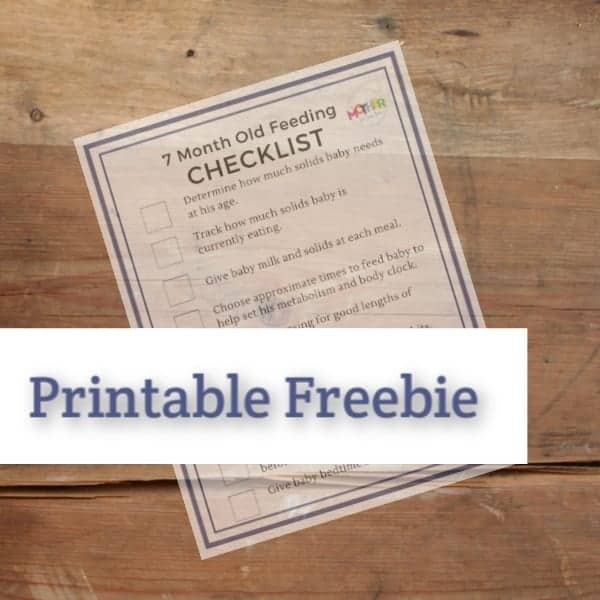 Want A 7 Month Old Feeding Checklist? 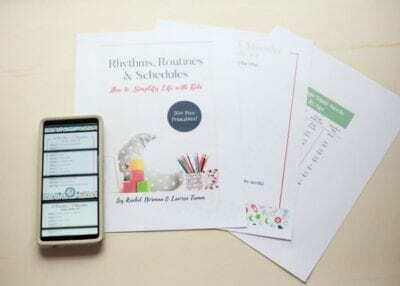 Click here and get the 7 month old feeding schedule checklist sent to your inbox so you can print it out and get on with it.